The Shure SM7B Vocal Microphone is a dynamic microphone with a smooth, flat, wide-range frequency response appropriate for music and speech in all professional audio applications. It features a cardioid polar pattern, bass roll-off and midrange emphasis (presence boost) controls, and shielding against broadband interference. An internal air suspension shock isolation helps to eliminate mechanical noise transmission and a yoke mount facilitates mounting and provides precise control of the mic position. The flat-frequency response enhances the midrange and high frequencies that are associated with the human voice. Improved rejection of electromagnetic hum, optimized for shielding against broadband interference emitted by computer monitors. Internal air suspension shock isolation virtually eliminates mechanical noise transmission. The built-in pop filter eliminates the need for any add-on protection against explosive breath sounds, even for close-up vocals or narration. 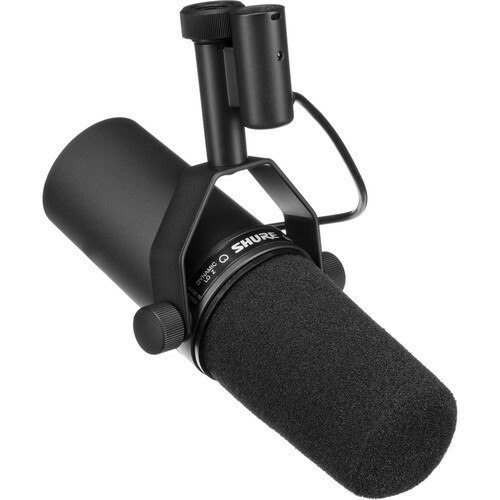 SM7B Vocal Microphone is rated 4.7 out of 5 by 31. Rated 4 out of 5 by C. Pena from SM7Best? I bought this mic to use in my home studio. The supplied windscreen really provides great proximity. The rear controls (Flat Response, Bass Rolloff and Presence Boost) are also very useful. If you buy this mic, try different settings in using such controls. You'll need either a preamp or a mixer to get the best of the mic. Rated 4 out of 5 by The Colonial from Lovely sound, very low output We use the SM7B as a voiceover mike, so the input level is relatively low (i.e., not drums, not screaming vocals). It has a perfectly lovely, warm sound, and exceptionally good isolation. The isolation, however, comes with a price: Very low output level. Even +60dB of gain barely brings it up to a reasonable level. (Of course, you don't have to worry about clipping anything!) Be sure to pair with a powerful, and very quiet, preamp. Rated 5 out of 5 by Anonymous from Great for male vocals and spoken word. I use the SM7B for recording male vocals and, occasionally, to do a podcast. This microphone has excellent presence and is very forgiving when used for vocals. The bass and the middle are smooth, and the highs are exact without being unpleasant. Little tweaking is needed to make it sound good. Highly recommended for similar uses! Rated 5 out of 5 by Moozgit from More versatile than you think This microphone is always billed as a vocal mic. I personally find it to have a ridiculous amount of other applications. horns, drums, cymbals, electric guitars, etc. I especially love it on saxophones. it gets an incredibly rich, full, yet clear sound out of them when given a couple feet of space and needs very little processing if any. a great addition to a mic cabinet. buy 4 of em! Rated 5 out of 5 by Anonymous from Great Podcast & Radio Broadcast Mic This is the best Mic for the price for broadcast and podcast applications. I have used RE20 and Sennheiser MD421 and the SM7b is my favorite. It has a sweet low end proximity bump that is great. ...My order arrived before 10am the next day! Rated 5 out of 5 by Anonymous from Great Mic! The Mighty SM7B. One of the great all time vocal mics for sure. I use this thing all the time. It's a great mic to have in the arsenal. If I were only going to own one mic, it might be this one. Rated 4 out of 5 by Anonymous from I feel like a pro I feel like a pro with this microphone. It just feels so sturdy and professional. I need a preamp to really get good sound but its helpful in a non air-tight room where other sounds can leak in. Rated 5 out of 5 by Atomicon from Awesome! Used it for guitar and vocals, handled both like a champ, loud and quiet, even when my vocalist got a bit excited and literally started smashing his mouth against the mic while recording. Beautiful clear tone. I even A/B compared it with a vocal performance by the same singer from a prior take using a MUCH more expensive microphone and it totally stands up. I don't think you could get much better for the price. Definitely needs some preamp boost on the way in, though. Hi I had good luck with this low output dynamic mike by running the Shure SM7B to a Cloudlifter transformer then into any good pre amp with Phantom Power. The Cloudlifter uses the pre's phantom power to ad gain to the Shure's relatively low output signal and not to power the mike directly like a condenser mike would need.Good luck. Why can't you ship the Shure SM7B to Australia? This is a restriction placed on all USA authorized Shure dealers and enforced by SHURE USA. whats the best mic pre amp compressor to use ? Is there an affordable USB audio interface you'd recommend for using the SM7B to record with a MacBook Pro? Shure recommends at least 60 dB of gain, which means that a lot of USB audio interfaces won't cut it. I'll gladly spring for the mic, but don't want to spend a fortune just to be able to use it. Shure SM7B will work with the Roland R-26 recorder? Shure reports that SM7B requires a minimum of 59 dB gain. Rolnad R-26 in the specification has a -62dBu output level. This microphone will not require phantom power to operate (it is a dynamic mic), however James M makes a good recommendation regarding the inclusion of a preamp to raise the level.